My anti-bias activity I chose is a Culture Calender from Roots and Wings on page 195. The reason I chose this activity is because there are many, many activities that stem off of it as well as the meaning of the different culture holidays for the children. The children will easily find out about other children's families and holidays that they celebrate in their culture. I think this activity would be very effective on the children also, because they will see the holidays the school celebrates. This is an activity the children and the teachers could keep on all year long. In the book it states that this calender will help the children recall the past, celebrate the present, and anticipate the future. This activity is age appropriate because it does not support the "tourist" aspect of anti-bias curriculum (York, page 182). It is an activity that the children will always be involved and is all year long (instead of just a certain time period). This activity will inspire the children to learn and be exciting about celebrating other cultures. It can be included in different themes such as Families, My Culture, and Our Class (York 195). The Cultural Calender would be a good activity to carry out during the whole year for an anti-bias activity because it does not include many different conversations about deep rooted stereotypes. It spends enough time on culture without making stereotypes stronger (York 187). Some of the activity goals that this activity uses are introducing children to other cultures, help children live happily and cooperatively in a diverse world, and that many different people live in our community. I definitely think that this activity will introduce children to other cultures because it will involve many different family cultures. They will recognize their family and appreciate their own cultural heritage as well as their classmate's. This activity will encourage children to be happy and be cooperative in a diverse world because it introduces many other cultures and recognizes different feelings and emotions towards anti-bias. They will be sharing their families celebrations with others as well as a experiencing belonging in the classroom. This helps the children become more positive about themselves within the cultural curriculum (York 128). This activity will show them that many different people live within their community. The children will experience and explore similarities and differences in a positive way as well as show increasing comfort with human diversity (York 140). Through this activity, the children will develop positive outlooks on different cultures, families and celebrations through out the community and in the world. The children will also become comfortable and empathetic with the diverse group of people in our world. To produce the Cultural Calender there are a few materials needed. The materials needed are 12 calender grids. You can create your own or create it on your computer. I think it would be awesome if you create your own version of a big calender and hung it up in focal point of the classroom. You would need a yard stick to achieve that. You also need fine point felt-tip pens. After you have an idea and the materials needed for the project, then start by sending a note home to parents about the calender and ask them to make a list of the holidays and celebrations they observe each year. Create a time line with all of the family's information on holidays and celebrations and then add all of their holidays/celebrations to the main calender in the classroom. "Keep the calender up all year long. This will help the children recall the past, identify the present, and anticipate the future." (York, 195) It will be important to add information about the holidays the school, community and local neighborhoods participate in. 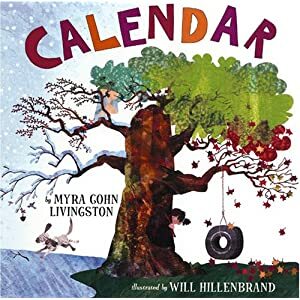 A few of the books you can read along with the calender is called Calender by Myra Gohn Livingston. It the book it explains about all of the seasons in each 12 months of the year. It goes into the feelings one would get in each of the months. This next book is called The World Holiday Book. It's got a celebration for each day of the year. Very multicultural and lighthearted when it comes to reasons to celebrate! An extension you could use with the Cultural Calender is invite each child to bring an item from an unique holiday the celebrate. Each child can have a turn sharing the special celebration and the artifact form the holiday and their culture. The children will learn new celebrations from each other and get to handle items from a different families cultural celebrations. I really enjoy this simple way to incorporate multi-cultural and anti-bias curriculum in the preschool aged setting. This also would require parent involvement which would stregthen the relationship between parents and their children's anti-bias curriclum. Parents support is need in these crucial steps to anti-bias education for young children! I love the idea of a culture calendar for the classroom. I have a niece that recently turned 8 and she absolutely loves to looks at calendars to see what holiday or event is coming up next; her 6 year old sister also loves to stand by her and hear what's coming up. Having all the cultural activities of the students in the classroom on one calendar is a great way to show unity and get everyone excited about the events. This is definitely something I would use in a classroom setting. Nice job! Wonderful project! You had a great point when you said it is a year long thing. That seems so perfect because children will be learning about other cultures all year long instead of just every few weeks or so or maybe even less. Greta job! Those books look so cool! This activity is so great to put to use all year long. I would personally like using a large calender to make it an important focal point in the room. Recongnizing each culture and their holidays within the classroom and within the community is an awesome way to get the children excited and involved. You did a great job presenting this activity! This sounds like a great way to get the parents involved in the classroom! This activity makes it about the children and the norms that they are used to and teaching the other children about it. I really want to read the World Holiday Book now. I think it'd be so cool to know that everyday something is being celebrated (other than birthdays). 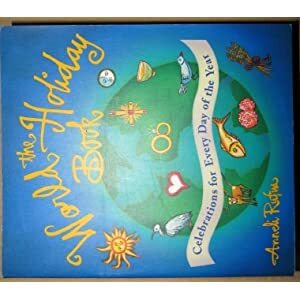 I really like the world holiday book. This activity is a year long way to introduce other cultures and holidays and keep track of it on a calender. This is more than just a week project, and kids most likely will not forget the year long calender. Great activity.